Or not going. 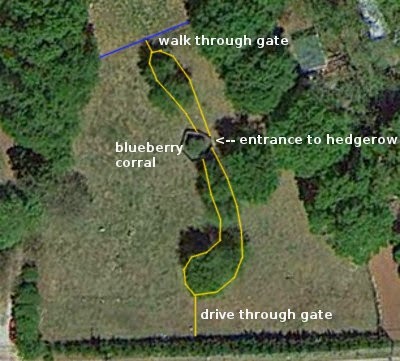 I've had a few setbacks since I first started planting my forest garden hedgerow in March of 2015, and have not been able to plant as much as I'd like. I've replaced one of the pears, the mulberry, one of the chestnuts twice, and have just finished my third planting of aronia. None of the herbs survived last summer's heat and drought, but the Jerusalem artichokes I popped into the ground last winter made it with no additional watering from me. That was nice to see! I chose tree and shrub varieties based on their heat and drought tolerance. They did get watered and mulched several times during the summer, but not enough. Plus the chickens quickly unmulched them (much to my great frustration.) I finally made small cages from short lengths of welded wire fence. bush is turning red in the background. The ground was so hard and dry that it took a couple of days to dig the hole. I scraped out an impression in the ground which I filled with water. The next day I dug that out and filled the hole with water again. Aronia. With the cage the chickens can't scatter the mulch. One thing that is important, for me at least, is the time of year I plant trees and shrubs. If I plant them in autumn or winter they do best. Anything planted in the spring seems to have a less than 50% chance of surviving our summers. I've stopped ordering from nurseries that insist that April is my prime planting month, because summer comes on fast and furious in my little part of the world. It becomes extra work to try to keep the new plants alive and well. In weather news, we've had rain! Until this past Tuesday our last good rain was in August, when we got a total of 3.5 inches for the month. In September we got no rain, and then 0.25 inch in early October. The 3 inches at the tail end of November was sooo welcome. Best of all it was a gentle soaking rain. Big rain puddles make the ducks happy! The rain is also a relief for the Southern Appalachian wildfires. Some of you have asked if they've been a threat to us. We did get a smokey haze when the wind blew from certain directions, but we haven't been under imminent danger. It's raining again today and is forecast to continue over the next several days. That will help as well. The ducks look happy indeed! I'm glad to hear that you're in no danger. Glad to hear no smoke! 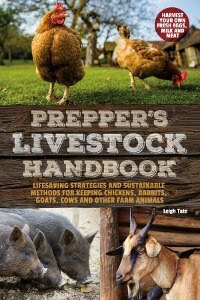 So, are you prepared for if there was imminent fire danger for you and your critter. Thanks! Even though Muscovies aren't considered to require as much water as other breeds of ducks, I have to say that they love their water nonetheless. Especially clear, clean water. Even though there supposedly wasn't much chance it would head our way, I did think about it. I honestly don't know what we'd do, because we don't have a trailer in which we could haul and house the livestock. Something to think about. I've been doing some research on how to establish plants in drylands, and I'm experimenting with some cheap interventions this year. Because like you, planting in autumn and winter seems to be the best time. However, not necessarily so, either. I can get a plant to live through those less intense months, but once the heat and lack of rain kicks-in, they can die. So I got them to a certain point, but always hit that hump which seems to undo all my efforts. I actually need to be able to plant them in spring and summer, so I can get the most growth. But I also need to get a continual water supply and shading to them as well. I'm trying those interventions this growing season, and hope to report on my results, when the cooler season arrives again. The ducks do look happy! The aerial view shot is so cool! I guess you got that from google earth; apparently, google doesn't have such clear pictures of our part of the world - every view looks like a kid coloured a drawing of what he THINKS our property looks like (if the kids was completely blind). Spray paint your ph number on the sides or back of your stock (pigs, goats, cattle, horses), then open all the gate to turn everything loose; their instincts will see them flee from fire. Hopefully, when the danger has passed they will return home hoping that suppertime is ready. The ph numbers will help neighbours & authorities identify who the animals belong to (for those who don't come home on their own). My home province had a serious wildfire (Ft McMurray) that saw people crowding the highways to get out. One family had 2 horses in the trailer they were pulling & their teenage daughter riding her third horse out to safety (like a BOSS). There were many such stories. How do you keep the deer from eating everything once they grow past their hoops? The deer here are eating EVERYTHING. I would love fruit trees...I want to grow elderberries (again) next spring..Everything I plant I have to plan a wire tunnel-big enough for plants, and harvesting! Its such a disappointment to plant and plant and get nothing out of it..this past summer..and this coming spring, I am taking the daunting task of a high garden fence and moving veg to an enclosed raised bed area..not easy at 70.. In France they say: "Á la Sainte Catherine, tout bois prends racine". It means "On St. Katherin's fest day (Nov. 25th) all wood plants grow roots. It's the best time toplant for me, here in my Csa climate. Semi-arid climate here. I water trees, chrubs and perennials only the first three summers. I water twice or three times a week (if there is no rain, which happens all summer), a bucket per plant. The plants are planted in depressions and heavily mulched. After those three years, if the plants dies, that's too bad. Glad you are getting rain down there. We have some here in the mountains too. It's been raining pretty hard, on and off, but the Weather Channel said this morning that the fires in North Georgia, Tennessee, and North Carolina are still not 100% contained. I don't know what it's going to take to make all that go away. Will you have to protect the sapling trunks from bark-eating critters? I saw a whole row of young fruit trees killed by something that effectively girdled them - I was told it was mice desperate for food either during or at the end of a hard winter. I know folks sometimes just release animals when the danger is imminent, and it would have to be extremely imminent for me to do that. Mostly because of our proximity to roads and town. If they had to cross busy roads to flee it could be difficult. Fortunately we haven't had to think that dire at this point! A contingency plan for the future would be wise, however. Chris, I'm always interested in your experiments. :) For the summer garden, I've thought it would make sense to plan for an earlier harvest, say of tomatoes and cucumbers. Then if they make it through the heat and start producing again when it gets cooler, that would be a bonus. We had to pick and choose what to water, and that was tough. For the hedgerow, new plants need to establish a deep root system, then like Lucia says, they have to make it mostly on their own with less intensive help from us. Some of the google aerial shots really do very CG, and I can't help but wonder why. They do seem to be working on updating them. Still, we have some pretty odd looking "trees" and "rooftops." I haven't had deer problems in the hedgerow, but I do in the garden. They've demolished my beet crops for the past several years now. I agree it's extremely frustrating to lose hard work to them! We've fenced, double fenced, added ribbons to the fence, even a pulsing solar light which is supposed to keep them away. They do not like "deer-b-gone" spray! I like that! Having enough moisture to establish a good feeder root system is a must. That's why autumn is my best planting time for trees and bushes too. Hopefully this new round of rain is helping, but I guess we won't know how much until it passes and they can assess the situation. Well, I have never had that happen. I've had goats eat all the bark and girdle trees, but not rodents. Of course, we have a good rodent control squad, and I've noticed a marked decrease in our mouse, squirrel, chipmunk, shrew, and rabbit populations. Both you and Lucia are correct, Leigh, as my research has led me to believe too. It's the first year which is crucial to get that main root down into the ground. Tree roots are strong enough to split boulders, but it takes them many seasons of growth to do so. It's the first year which sets them up to do that though. Thanks for adding your experience Lucia. Us dry land growers have to be pretty harsh with our attitude towards plants. The first year tells me whether a plant will make into further seasons. It generally won't survive the first summer, whether I plant in autumn or spring. 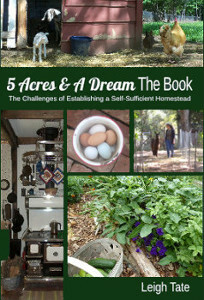 And that points to the need to observe and become familiar with one's own homestead ecosystem. I just wish it didn't take so muc trial and error to figure out! It's a valuable lesson to focus on what grows well with fewer inputs, than in trying to establish something more exotic and labor intensive for one's area. Here in Australia where we get stinkingly hot and dry summers, the best time to plant is also Autumn. Planting in spring is hard work - it requires too much water and too much effort to provide shade of the thing planted and even then plants often die despite mulch, water and shade. So nice to know you got some much needed rain Leigh. Nice hedgerow also. I have given thought to one as my good friends had a lovely one established for their goats. But too many other things topping the "to do" list right now. Looking forward to updates on more rain in the future for you. caught rabbits girdling a young tree in the snow. put wire fence around it. deer- soak raw egg whites in water and spray the water on plant leaves. deer hate it--so will you but the plant is protected 'til rain washes it. lived in oklahoma decades ago. university there did a study which said it is better for a tree to establish in soil as is rather than to enrich the planting hole. My problems are similar here in CT. Deer, rodents, birds AND a crazy high water table. Solution: Tent fittings and top rail sitting ON the ground, deer netting on top/hardware cloth on the bottom, and a LOT of zip ties. I had kept the deer out with this set up in pipe sleeves. The rodents and the birds, however, robbed me blind. I was recovering from heart surgery, so no heavy lifting. We configured the pipes into a cube and then put the bird netting over top over top of the structure so that the birds couldn't light on top of the netting and poke the berries out through the netting. By weighting the netting, the chipmunks couldn't get in. The very first blueberries I have gotten from my FOUR YEAR OLD PLANTS!!! The pipe is gotten locally at big box stores (top rail for chain link) and the tent fittings are from party tent suppliers. They have screw eyes that hold each joint onto the pipe. The pipes are 10.5 feet long, so I cut them in half for height. On long rows, I sew the bird netting together. These are called Fruit Cages in England. The point of this whole thing is to make it easy for me, in my impaired state, to protect my fruit. In the winter, we take the whole thing down and tarp the pipes/fittings. Bird netting gets rolled up and stored in a trunk to keep the mice out. It is a big investment in the beginning, but I have lost hundreds of dollars in fruit every year to invaders. Both of my springs are running full force after my recent rains. I had to reorganize my duck set up because of it. This is the time of year to plant. If you order from Raintree Nurseries, they will send for fall planting. If people wont, then you need to heel them in somewhere shady until you can move them in the fall. I have tried many nurseries, but Raintree plants always seem to survive. Up here, the old timers just planted Osage Orange trees and they do so well, that they are known as Hedge trees up here. They do make a good hedge row but I would much prefer what you are doing. I like native and though they are native (Indians made bows from them), they are definitely monoculture and I love variety. Having planted upwards of 10,000 trees over the years on the farm, I have always had a higher success rate in the fall. I think a lot is because they get to go unnoticed by the deer for half a year but I also think the dormancy period does a lot to settle the soil around their roots and get rid of lethal air pockets when they are sucking up nutrients in the spring. Wanting to plant a bunch of trees a couple years ago but only finding nurseries that would sell them in the spring, I got them in the spring and planted them in pots on my deck until fall when I replanted them. The time in potting soil didn't seem to hurt them at all. Of the 12 that I planted, 11 are still alive and the one gone is completely gone. I suspect rabbits on that one. They are now going into their second winter and if I plant anymore in the future, I think I will try that again so I can plant them in the fall. I should note that I had read potting soil was not recommended but I never figured out why. I used it because it was easy to fill in around the roots and avoid those air pockets. Barb, that sounds like a bit of work but well worth it. As you point out, it's a huge financial loss-worth of fruit. The objection to bird netting is that the birds eat right through it, but this is an excellent solution. I will consider something similar for my elderberry bushes. One thing I've noticed is that spontaneously planted seeds seem to do much better than transplants! We've had potted plants root themselves into the ground too, but not as bad as that! Fran, with so many commenters agreeing with you, it's amazing to me that nurseries still recommend spring planting. Thanks Terry! The hedgerow has a long way to go, but if I can get the trees established and growing, I'll be thrilled. It's raining again today! We've gotten over an inch so far with the second round of rain, with more on the way. What a relief. I thought it had to be rotten eggs, but if it's just raw whites, that's great news! Did they say what they meant by enriching the soil? Because we're done to clay when I dig the hole, I always mix in compost. Never considered that wasn't helping. I got a Raintree catalogue a few years back and was truly impressed with what they offered. My hesitation was that being in the Northwest, I was worried that their offerings wouldn't be acclimatized to our hot dry summers. I order my nursery stock from Stark Bros. They're in Missouri and probably a little closer in climate to us. I remember Osage Oranges from my years of living in Texas! I definitely agree about the dormancy period for new trees, but that's a good point about the deer too. I wonder if it's because potting soil has those little styrofoam (or whatever) filler balls in it? I usually mix up my own "potting soil." Our soil needs organic matter badly, and the addition of compost has never hurt, as far as I can tell. Time of year is more critical. It was a first in my experience, too, so I wondered. Maybe it was rabbits, as someone mentioned downthread. It is worth trying on one. I had Elderberry and the height is a challenge. You can make a fruit cage out of PVC, too. Home Depot sells what they call furniture fittings on line that give you the options for construction that traditional plumbing fittings do not. It is a slip fit operation so you can take it down after the season. You might need to anchor it in windy areas. The tent fittings allow you to build a huge tunnel that won't blow away. You can also buy more fittings at first and then buy the pipe as budget allows. I used tarps.com. VERY basic website, but really worth it. Thanks for the resource! I notice they have some shade cloths on clearance; something I've wanted to use over the hoop house for summer growing. Have to raid my piggy bank to see what I can get! I just found a post by Kev at An English Homestead about a mouse trap for tree-destroying mice! The post is here.